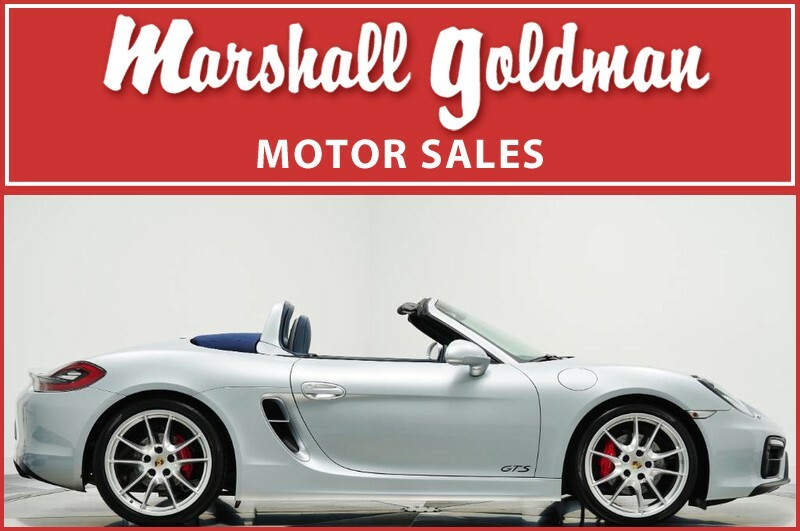 We have just added to our extensive exotic car inventory a beautiful 2015 Porsche Boxster GTS in Rhodium Silver Metallic with Yachting Blue leather and only 18,900 miles. This Boxster is loaded with: Porsche PCM with navigation, PDK transmission, Bose audio, 18 way sports seats plus with heating and ventilation, full leather interior, supplemental safety bars in exterior color, mobile phone preparation, steering wheel and gear lever in smooth finish leather, instrument surround in leather, center console and dash trim trim in bright silver, Porsche logo embossed in armrest, two zone automatic climate control, dynamic light system, mirror bases in silver, reversing camera, sport exhaust, center caps with colored crests, storage net in passenger footwell, dark blue convertible top and more. Family owned and operated, Marshall Goldman Motor Sales and Leasing has been pairing the best in luxury automobiles with discerning customers across the globe since 1978. Every car we offer is owned by us and is on site in our massive 40,000 square foot indoor showplace. Call us today and find out what legions of satisfied customers already know: Our staff's professionalism and our unparalleled inventory offer a buying experience unlike any other. Buy the best, from the best!